QATestLab, an independent provider of QA and software testing services, attends the biggest e-commerce event in the heart of Berlin. The mission of the event is to provide business opportunities for the entire e-commerce system. 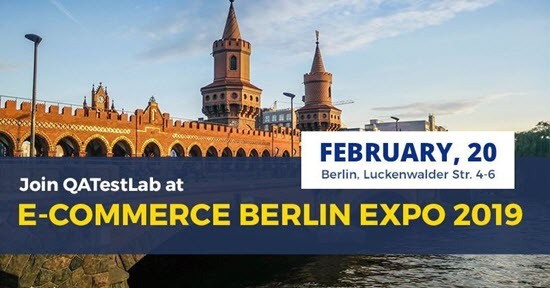 The E-commerce Berlin Expo offers visitors a rich and relevant program with a complete range of products and services essential to drive online retail performance. This year over 5000 participants are expected to visit E-commerce Berlin EXPO: from merchants to platforms, hosting providers, fraud prevention solution providers, payment processors, and other online solution businesses. Around 150 exhibitors will present their products and services on topics such as cloud, hosting, design, e-mail marketing, e-payments, e-shop software, social media, SEO, web development and web analytics. Basing on previous experience, the organizers decided to present a wider spectrum of knowledge in the form of short presentations. 40 experts on 4 stages from the e-commerce sector are going to speak about blockchain for e-commerce, voice-search future technologies, AI/Machine learning for e-commerce platform, direct-to-consumer brands, and general e-commerce trends in 2019. Among the featured speakers are key figures of Google, Facebook, idealo internet GmbH, Otto Group, Zalando, moebel.de, and others. The E-commerce Germany Awards 2019 ceremony will take place at the networking party on 19 February 2019 during 7 p.m. – 11 p.m. (the night before the official expo). It’s a great chance to connect with all exhibitors personally and establish some new contacts. Meet QATestLab team – Alyona Gritsuk, Head of Sales, and Yana Miniailo, Business Development Manager.